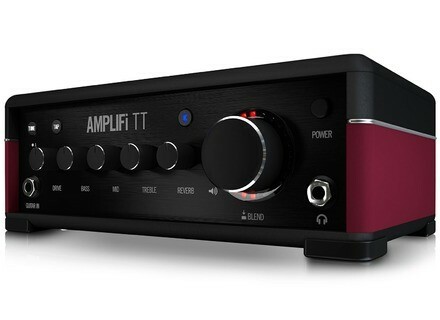 AMPLIFi TT, Modelling Guitar Amp Head from Line 6 in the AMPLIFi series. 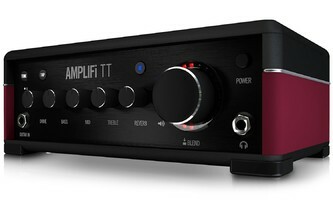 The AMPLIFi TT is still based on the Line 6 remote controlled modeling amp concept, using Bluetooth to communicate with smartphones and tablets, but in a new tabletop compact format without built-in speaker. Plus, it can be connected to a computer via USB to record directly your guitar sound to any DAW. The AMPLIFi TT features more than 200 amp, effects and cabs, 100 built-in presets and you can create, share and download presets from the community via the Cloud with the AMPLIFi Remote app. Note that you can use up to 8 effect simultaneously. The front face of the amp features drive and reverb knobs, a three-band EQ and a large push knob to adjust both the guitar level and the volume of the music you play through the system. Headphone output and instrument input are also available on the front face. You also get access to a chromatic tuner, a tap tempo button and the amp matching feature is included (the AMPLIFi TT automatically chooses the amp and effect settings to match the music played from your library). On the rear, you’ll find RCA and 1/4“ stereo outputs, an optical output, an amp output, a USB port and an FBV controller port. The AMPLIFi TT is compatible with the iPhone 4 and later, iPad 2 and later, iPod Touch 5th generation, as well as with a selection of Android 4.2 - 4.4 devices (Samsung Galaxy, HTC, Motorola Moto X, Google Nexus 7, Amazon Kindle Fire HDX, ASUS and LG). Street price of the AMPLIFI TT is 189€ in Europe, it will be available in January, 2015. More info soon at line6.com. Walrus Harvester limited edition overdrive Walrus Audio celebrates Thanksgiving with the limited edition Harvester overdrive pedal, which will be available next Friday.